I love praying the Rosary. It always has given me peace whenever I have recited it, and my family prays the Sorrowful Mysteries together each Lent. However, the person who had the greatest devotion to the Rosary in my family was my Protestant Uncle Ralph. When I was growing up my family lived next door to Uncle Ralph and his family. Uncle Ralph was my favorite uncle. He always had a sense of fun, loved to shoot the breeze with kids and did a hilarious Donald Duck imitation. My Dad’s family were all Protestant; my brother and I were Catholic because my Dad had married my Catholic Mom, so I was surprised one day during my teen years when Uncle Ralph pulled out his Rosary and told me how he came to always carry it. Last Saturday was the 60th anniversary of the armistice ending the Korean War. That War produced many Christian martyrs as the Communist powers actively persecuted and murdered Christians luckless enough to fall into their hands. One martyr that has never received the recognition that I believe he deserves is Bishop Patrick J. Byrne. Born on October 26, 1888 in Washington DC, he was ordained in 1915 and joined the newly formed The Catholic Foreign Mission Society of America, better known today as Maryknoll. 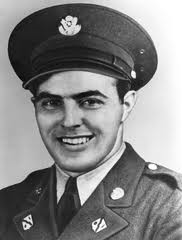 In 1923 he was chosen to begin the mission in Korea. Named Prefect Apostolic of Pyongyang. By the time he returned to the States in 1929 the Catholic population of Korea had increased by 25,000 and there were numerous Korean priests and sisters. In 1935 he was assigned to open a mission in Kyoto, Japan and in 1937 was named Prefect Apostolic of Kyoto. Kept under house arrest during the War, he broadcast calming messages to the Japanese people, at the request of the Japanese government following the surrender of Japan. During the occupation of Japan, Supreme Allied Commander General Douglas MacArthur praised Monsignor Byrne for his assistance in helping bring peace to Japan. In 1947 he was named Apostolic Visitor to Korea. Two years later he was named the first Apostolic Delegate to Korea and titular Bishop of Gazera. Well, I guess this was inevitable, at least I am sure that faithful readers of this blog will think that it was inevitable! Every year my little town has a festival, Dwight Harvest Days. We draw tens of thousands of visitors from all around for parades, a flea market, a craft show, rides, a 5k run, and many, many other events. This year, I have arranged, well I should say the Dwight Rotary Club, of which I have been a member for 28 years, has arranged, for Michael Krebs and Debra Ann Miller to bring their presentations of Mr. and Mrs. Lincoln to the Dwight High School Auditorium on September 21, 2013 at 7:00 PM. The presentation is free and I think we will have a huge turnout, especially among students. What’s the Matter Stephen Foster? Something for the weekend. That’s What’s the Matter by Stephen Foster. The Civil War probably killed Stephen Foster. The most notable American composer of his time, in a day when copyright enforcement was nil, Foster always just managed to scratch out a precarious living. As the beginning of the song indicates, with the coming of the War many of the songs he had written in peace were no longer in demand. The greatest of all cavalry raids in the Civil War was that undertaken by Brigadier General John Hunt Morgan and his 2,462 Confederate troopers from June 11, 1863 – July 26, 1863. Riding over a thousand miles behind enemy lines, Morgan and his men created panic in several Union states, and caused Union forces of well over 100,000 men to be mobilized against them. During the raid they captured and paroled approximately 6,000 Union troops and destroyed millions of dollars in Union war supplies, railroads, bridges, etc. By the time that Morgan and 700 of his men surrendered in Northern Ohio, they had succeeded in spreading chaos wherever they went and diverting Union attention away from Confederate General Bragg’s operations in Tennessee. Morgan made a daring escape from captivity in November of 1863, but that is a story for another post. After the War the veterans who had rode with General Morgan formed the Morgan’s Men Association and held annual reunions. 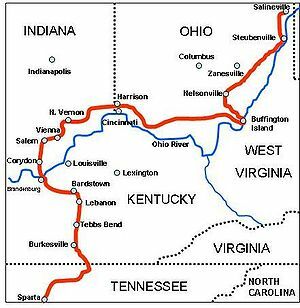 In 1898 they met in Cincinnati, guests of their old adversaries, veterans of the 7th Ohio Calvary. The twenty-sixth in my ongoing series examining the poetry of Rudyard Kipling. The other posts in the series may be read here, here , here , here, here , here, here, here, here, here, here, here , here, here, here , here, here, here , here, here, here , here, here , here and here. For a man who was not conventionally religious, it is surprising how many of Kipling’s poems deal with religious themes. Here he deals with the fate of the soul of Tomlinson who floated through life and did almost no good and almost no ill. He fits to the full T.S. Eliot’s hollow men and CS Lewis’s chestless men. Kipling wrote Tomlinson in 1891 and unfortunately his Tomlinson was a forerunner of a type all too common today. God did not bring us into this world so we could spend our days in indifference and ennui, wasting both our time and our lives. The poem has a comedic tone, but I have always regarded it as perhaps Kipling’s most damning indictment of his time and ours. 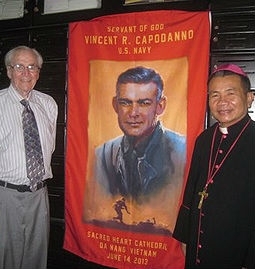 DA NANG, Vietnam — Bishop Joseph Chau Ngoc Tri of Da Nang recently said Mass in honor of Father Vincent Capodanno, a U.S. chaplain killed during the Vietnam War, and he encouraged his people to ask the priest’s intercession. Ted Bronson, a retired Navy Captain, told Catholic News Agency June 26 that Bishop Tri “is a brave bishop, fostering Capodanno under the umbrella” of Vietnamese communism. The Mass, said on June 14, marked the 55th anniversary of Father Capodanno’s priestly ordination. Father Capodanno was ordained for the Maryknoll Missionary order, and he later became a chaplain for the U.S. Navy. While with Maryknoll, Father Capodanno served in Taiwan and Hong Kong, and then he requested to be reassigned as a chaplain with the Marines. He was sent to Vietnam in 1966 and requested an extension to his tour of duty when it was up. On Sept. 4, 1967, his unit was in the Que Son Valley near Da Nang, and they became outnumbered by North Vietnamese forces. As American soldiers were being gunned down, Father Capodanno went about giving viaticum and anointing to the dying, as well as medical aid to the wounded. Shortly after reassuring a wounded Marine, Father Capodanno went to another soldier who had called out for help. Both he and the solider were shot and died. He was awarded the Medal of Honor in 1969. I had always said that the worst thing that could happen to any parent was to have a child die. Until it happened to me recently I really did not comprehend how true that statement was. Abraham Lincoln would live to see two of his four sons die. His wife would see three of their four sons die, as well as having her husband murdered before her eyes. So much unbearable grief for one family. At the Lincoln Museum that my family and I visited in our annual pilgrimage last week to the Lincoln sites in Springfield, there is an exhibit where Mary Todd Lincoln sits in a room by herself as rain beats on a window. This is a representation of her intense grief after the death of Willie, her second son to die. I have always had a great deal of sympathy for Mrs. Lincoln, thinking that she has been treated unfairly in many historical accounts, but after experiencing myself the grief that she experienced three times, my sympathy for her is now boundless. 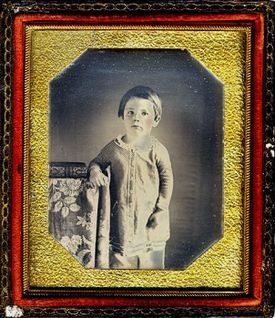 The first son of the Lincolns to die was Edward Baker Lincoln at three years on February 1, 1850 of tuberculosis. Both the Lincolns were devastated by his death. A poem which was published in the Illinois State Journal the next week reflected their grief. Wrongly attributed to the Lincolns by some historians, the poem was actually written Ethel Grey in 1849 and was not meant to apply to Eddie Lincoln. A friend of the Lincolns probably had it published in an attempt to comfort them. If Oliver Wendell Holmes Senior is remembered at all today, it is primarily as a poet and author, and as the father of Supreme Court jurist Oliver Wendell Holmes, Junior. This does him an injustice as he was by profession a physician and medical reformer, who, before the discovery of the germ theory, fought consistently for better hygiene in medical treatment. He helped revolutionize the training of physicians in this country and can be considered as one of the founding fathers of modern medicine in the United States. 1. A physician holding himself in readiness to attend cases of midwifery should never take any active part in the post-mortem examination of cases of puerperal fever. 2. If a physician is present at such autopsies, he should use thorough ablution, change every article of dress, and allow twenty-four hours or more to elapse before attending to any case of midwifery. It may be well to extend the same caution to cases of simple peritonitis. 3. Similar precautions should be taken after the autopsy or surgical treatment of cases of erysipelas, if the physician is obliged to unite such offices with his obstetrical duties, which is in the highest degree inexpedient. 4. On the occurrence of a single case of puerperal fever in his practice, the physician is bound to consider the next female he attends in labor, unless some weeks at least have elapsed, as in danger of being infected by him, and it is his duty to take every precaution to diminish her risk of disease and death. 5. If within a short period two cases of puerperal fever happen close to each other, in the practice of the same physician, the disease not existing or prevailing in the neighborhood, he would do wisely to relinquish his obstetrical practice for at least one month, and endeavor to free himself by every available means from any noxious influence he may carry about with him. 6. The occurrence of three or more closely connected cases, in the practice of one individual, no others existing in the neighborhood, and no other sufficient cause being alleged for the coincidence, is primâ facie evidence that he is the vehicle of contagion. 7. It is the duty of the physician to take every precaution that the disease shall not be introduced by nurses or other assistants, by making proper inquiries concerning them, and giving timely warning of every suspected source of danger.